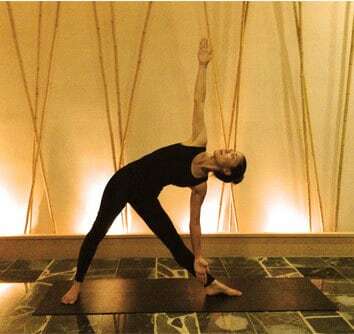 Try the only Hot Stone Yoga in the U.S.
We proudly introduce to you our SGE Hot Stone Yoga. The heated mineral-rich stone provides Negative ions and High-Speed Infrared Rays which helps to heat your body from the inside, including internal organs and restoring your body's cells back to a healthy condition. The yoga deep breathing helps to calm the body and mind, and helps oxygen circulate through your body. By combining SGE Stone and Yoga, your body will become complete and whole physically, mentally and spiritually. We will provide you a Yoga mat, Big yoga towel, bath towel , face towels, one 500cc bottled water ,bath roabs and amenities(shampoo, conditioner, body soap, lotion, shaver, hair dryer, hair comb, etc.). Please contact the lakewood location directly. 5 tickets $ 190.00 (reg. $225.00) $38/session|save $35.00! 10 tickets $ 350.00 (reg. $450.00) $35/session|save $100.00! 20 tickets $ 600.00 (reg. $900.00) $30/session|save $300.00! 30 tickets $ 840.00 (reg. $1350.00) $28/session|save $510.00! NOTE: these tickets are redeemable at spaRelaken Torrance only. 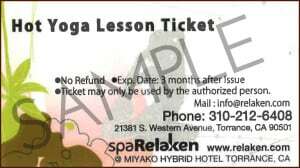 Unused tickets may be exchanged for Hot Stone Spa. Receive a special promotion notice through e-mail. Note: No cash value. Tickets cannot be redeemed for cash. 24 hour cancellation policy applies. We are not responsible for lost or stolen tickets.